Fat to fit diaries: How does one feel mentally and physically 9 days after the end of one of the world's toughest footraces? How does one feel mentally and physically 9 days after the end of one of the world's toughest footraces? Obviously the question of how one feels mentally and physically nine days after the end of one of the world's toughest footraces depends on the individual, and their previous multi stage ultra experience. I can only talk from my own experience as an ultra novice. Nine days on I can walk fine without any hint of a limp, the blisters are pretty much healed and the toenail that I lost will take some time to grow back but the skin that was underneath it has toughened up and it does not cause me any pain. So you could say that the superficial injuries have healed. But in terms of energy I feel pretty tired despite going to sleep at a decent time. My sleep is also disturbed and I seem to be moving a lot during the night. My muscles seem to twitch randomly and I often wake up with my calves threatening to cramp up. My groin is still aching slightly and my quads feel very tight and in need of a good stretch. A couple of days ago I had zero appetite but that has now come back, and I was really craving a pizza today. My cold seems to be getting much better and my immune system seems to be getting stronger again. That just about covers the physical state that my body is in. In terms of how I feel mentally, until yesterday I was just enjoying the time off and having a chance to organise the apartment and do all the little tasks that need doing. Today though I had a couple of feelings of emptiness without having an immediate challenge to look forward to. I also noticed that my short term memory is not as good as it usually is. Normally I have no need for lists and tend to just remember everything in my head until that list becomes overwhelming. Today though I had to write down a list with 3 points on it because I couldn't seem to remember the 3 points simultaneously. I also booked an appointment with someone, and then 5 minutes later I had already forgotten when I had booked the appointment for. Luckily I found the appointment card in my pocket. 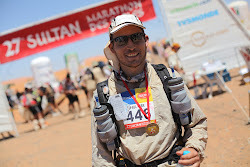 I read quite a few articles that talk about people having post race blues after the MDS. The advise is not to be fooled into thinking that once the initial pain is gone you can just jump straight back into training to get over those post races blues. It talks about just enjoying a few weeks of relaxing and focussing on non running activities. I have signed myself up for the Lucerne marathon but luckily I have 27 weeks to train for that. I can afford to ease very gently back into the running and still have plenty of time to follow an advanced marathon training plan later on. As I will be easing gently back into running I am going to take the opportunity to experiment with minimalistic footwear. Tomorrow I am going to go out and buy a pair of Vibram FiveFingers or VFFs as they are also known. I have also ordered a pair of Newton Sir Isaac Guidance Trainers, which are meant to help people transition from a heel or midfoot strike to a more efficient forefoot strike. It is going to be a lot of fun trying both of those out, as I am always one for new experiments. I am also returning to work next week after having had an 8 month sabbatical. That will keep my mind extremely occupied as I try to remember how all the UBS systems work and get back the knowledge that I used to have. I will probably have no time for post race blues until I have settled back in at work. I do strangely miss that week in the desert though, where all I needed to focus on was putting one foot in front of the other. I also miss the camaraderie that existed between the occupants of tent 72, between the Mencap extreme team members, between the British contingent and between the MDS participants in general. We all shared a truly unique experience together. Unless you take part you will never really appreciate just how tough the race is and just how much it tests your personal limits. If you are even remotely tempted to try it I urge you to go ahead and sign up. You will not regret it I guarantee you.